•The Lapmatic is the ultimate laptop stand, ergonomic and easily adjustable. •GREENGUARD Indoor Air Quality Certified® and GREENGUARD Children & Schools CertifiedSM. •Pneumatically adjusts in height from 20" to 30". 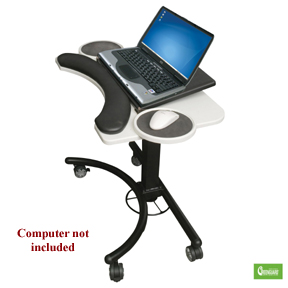 Black laptop shelf is angle adjustable and a mouse can be used on either the right or left side. •Includes a padded wrist rest and front is curved to provide ergonomic access. Black powdercoated steel frame with casters (two locking) for easy maneuverability.